I fell in love with Glengarry Glen Ross pretty quickly. It was my first exposure to David Mamet’s writing, hitting me at a time when I was seriously getting into film and beginning to notice the creators behind movies I was enjoying. Over the years I’d see more movies he wrote, including those he directed as well. Like may later appreciation for Aaron Sorkin, I was a sucker for the rapid-fire, ellipse-filled dialogue he specialized in, amazed at how detailed and nuanced it was. 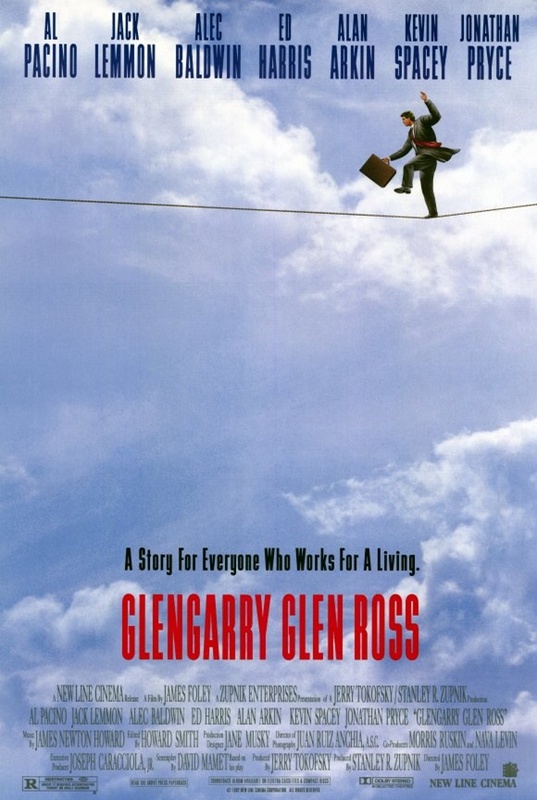 Based on Mamet’s own stage play, Glengarry is mostly set in the office of Premiere Properties, a real estate sales office. The salesmen there are hyper-competitive, always vying for advantage over the others in the office, employing whatever tactics might be needed to close the deal. Shelley Levene (Jack Lemmon) is the old veteran, Ricky Roma (Al Pacino) the slick hotshot and Dave Moss (Ed Harris) and George Aaronow (Alan Arkin) the guys who just want to do their jobs. When an executive from the home office (Alec Baldwin) shows up to explain people will be fired if they don’t meet sales goals, the situation gets even more desperate. Schemes are hatched to somehow access the new, high-quality leads dangled under their noses. One way or another, not everyone will survive the day with their job intact. With the movie recently celebrating its 25th anniversary, let’s take a look at how it was sold to audiences in 1992. Considering how unique the movie is and the kind of value proposition made in the trailer below, the poster always struck me as oddly generic. It shows a businessman in a suit and tie with his briefcase walking a tightrope set high in the sky. The impressive cast list appears at the top while the copy point “A story for everyone who works for a living” is near the bottom, just above the title. While neither the copy or the illustration are inaccurate, they’re also not great representations of the film being sold. It’s pretty bland, without the verve or spirit that could be conveyed. These seem like they could be used for any workplace-set story. Yes, the movie is about that – albeit an amped up, testosterone-filled one – but it’s about how far you’re willing to go in selling your soul to keep that job. The trailer opens in the middle of the famous speech by Alec Baldwin’s unnamed character as he tells Levene to “put that coffee down” because he wants to make sure all the salesmen in the office know what’s going on. They’re all on the cusp of being fired and the title cards that are intercut with the footage explain these guys will do anything to win. There are conversations that seem to hint at plans to rob the place to gain an advantage, which we soon see has actually happened, leading to accusations and investigations. That’s where the footage ends, though, with the trailer ending by touting the all-star powerhouse cast that’s been assembled. Not only is the trailer selling that cast, but it’s selling Mamet’s lightning-fast dialogue. Everyone is given a mouthful and the editing of the footage here only enhances the pace at which it’s delivered. It explains the story well enough, but that’s inconsequential. You’re being told the main attraction is the cast engaging in some serious verbal gymnastics. In some ways, the campaign undersold the movie. The poster doesn’t play to its strengths and even the trailer doesn’t go far enough in selling how dramatic and dynamic the story is. What the audience was promised was a glorified play, which isn’t wrong. It’s just not as pulse-pounding as it could be.